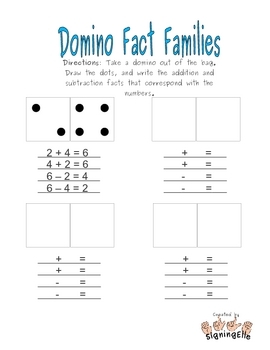 Do your students need extra practice with their addition and subtraction fact families? Are they bored with flashcards? 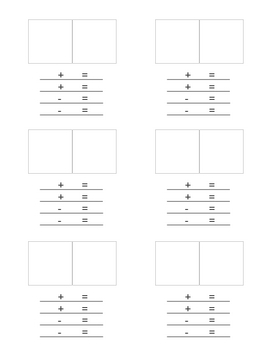 Print these pages as a double-sided worksheet, or put them in a sheet protector (with a dry-erase or overhead marker) for a quick-and-easy math center. Provide dominoes to the students, and voila! Instant fact-family practice! This worksheet provides simple reinforcement of number relationships through addition and subtraction. Differentiation is easy--you only need to limit which dominoes are available to your students. Like this worksheet? Download the multiplication and division version for only a dollar!